My bumming around day didn’t go exactly as planned. I ended up doing the dishes and some Christmas shopping. My heart just wasn’t in it, I guess. So I’m a loser who can’t follow through, after all. My heart hasn’t been in a lot of things lately. Perhaps I’ve got some kind of holiday bluesy thing going on. I don’t know. But last night I decided I needed to do something about it, so I turned to a tried and true prescription for happiness. You all know what I’m talking about. I started with this link that the incredibly thoughtful and awesome Julie gave me. I cowbellified some Foo with 48% cowbell and 30% Walken. I tried to post it here, but couldn’t figure out how to do the embedding thing. Go check it out. I’d recommend you amp up the Walken a bit. Thirty percent was a tad on the light side. Then I did a little youtube browsing, and found this little gem. Then I made some flair for you. I can be your cowbell hero, baby. I can clank away the pain. Yesssssss! Chuck came through for me despite his reservations. I decided if I was going to be a cowbell owner, I needed to know how to play it and play it right. I found several instructional videos, but this was one of my favorites. And finally, a merit badge Mr. T can get excited about. That was all very therapeutic. I’m ready to face the day. Even with all of my children home from school. What’s up with these non-student days anyway? Have a great weekend! Any big plans? Mr. T has a new writing assignment for English class—a biography. When I asked who he’s writing about, I can’t say that I was surprised to hear his answer: Chuck Norris. I’m not exactly sure what the criteria is for the subject of this writing assignment, but Mr. T feels confident that Chuck fits the bill. 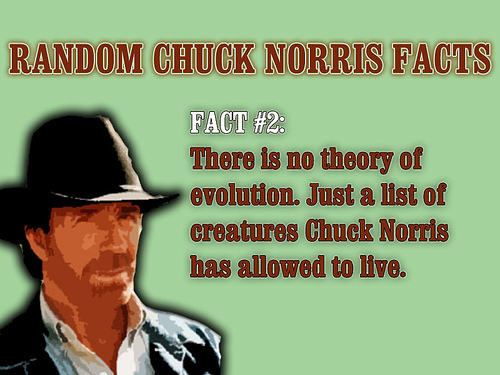 He’s been walking around spouting Chuck “facts”. When the Bogeyman goes to sleep every night, he checks his closet for Chuck Norris. Last night Mr. T mentioned he had a mini-draft of his report due, which was basically just a page or two showing the information and facts he’s collected so far. I said, “You’re not including these as the facts, right?” He looked at me like I was crazy then proceeded to rattle off all kinds of interesting information about Mr. Norris. Me: Wow. Maybe I should have you do a guest post on my blog. Chuck (my Chuck): You’ve never asked me to write a guest post. Me: Do you know anything about Chuck Norris? Dropping Mr. T off at school this morning. Me: Bye, bud. Have a good day. Mr. T: Because of his roundhouse kick, Chuck Norris has to have a license to carry a concealed weapon to legally wear pants in all 50 states. Bye, Mom. Love you. Our local paper ran a feature yesterday “Ask the Candidates”, in which local elementary school students posed their questions to Obama and McCain. There were a few gems I’d like to share with you. Dear presidential candidates, Can you make more books because I love to read. I would pick the candidate that said yes. Not the one that said no. Hello, my name is R. Why do you want to be president? Are you going to make prices lower for poor people? Will you stop the war? Will you make warm places for homeless people? Gee, I wonder who his parents are voting for. I suspect he’s a plant. Darn that liberal media! Will you make free stuff? Kids don’t get a lot of money. Will you let kids ride go-carts? So kids don’t have to walk places. Can you make schools a little longer? Hey, I’ll vote for anyone who promises me a free go-cart. What would you do if you were president? Would you be nice or mean? Would you be happy or sad? If you are not happy then why are you running for it. You need to be nice to the people. Being president is hard work. I propose a constitutional amendment: Only nice, happy people may run for President of the United States. No sad meanies! I, R., in the fourth grade, ask you why you are running for president? Why, I ask? Because the job of being president is a hard job! Being president can mean that thousands of people are counting on you. He’s right, you know. Out of the 300 million people in our nation, there may well be thousands of them counting on these candidates. And here’s what I would ask. If elected, would you run for re-election in 2012? I would pick the candidate who said no. Not the one who said yes. What would you ask the candidates? Oh, and how awesome would this be? You know what this country needs? More cowbell! I had this little conversation with Chuck over the weekend. Me: I found the cowbell I want on the internet. Chuck: A cowbell? How much? Me: Well, it is a musical instrument. Chuck: Where are you going to put it? Me: What do you mean? It’s like this (holding my hands 6 inches apart) big. Chuck: Are you sure? 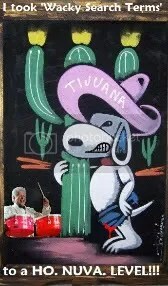 It seemed like on the video (the SNL cowbell skit) he was banging away on something like this (holding his hands 18 inches apart) big. Me: No. It’s not like a…uh…a statue or anything. It’s like this big. Apparently, I am alone in my enthusiasm for the cowbell acquisition. Le sigh. Yesterday, BigHugs tinkled (yes, I said tinkled—deal with it) in her little potty for the first time ever. She stood up and immediately started yelling for the whole family to come and witness. She was so excited standing there next to the potty pointing most animatedly at her work. I thought, “This is the moment. Right here, right now everything changes.” I had been longing for this day for months, nay years, but then I was no longer certain I was ready for it. Do you know what it means to commit, truly commit, yourself to potty training? It’s a full time job, people. Running your child back and forth to the potty, checking for dryness and stimulated bladderness every 15 minutes, cleaning up the inevitable accidents. But then all my fears were laid to rest as she refused requests for an encore performance the whole rest of the day. Now I’m back to longing. Le sigh. My washing machine is mocking me. “You think you’re so smart with the duct tape and the half-butted (I’ve been trying to clean up my act lately—don’t worry, I’m sure it won’t last) repairs?” it sneers. I think I may have over estimated the powers of duct tape. My little makeshift jimmy-rigging of the sensor doohickey thingy-majig only lasts two cycles, if I’m lucky. Sometimes I’m retaping every cycle. I’m almost through an entire roll of duct tape. How? How do you run out of duct tape? We’ve only replaced our family roll of duct tape (what, doesn’t your family have a roll of duct tape?) like once in the fourteen years we’ve been married. I might just have to admit defeat and have the darn thing repaired. Le sigh. Incidentally, I found this little explanation of my post title on the internets and was mildly amused. Le sigh is often used in mediocre conversation to imply a sigh for whatever random reason. People generally use it because they assume it makes them look interesting or intelligent, when in all actuality it makes them look like a moron, as most things French tend to do. I thought I was just having a Pepé le Pew moment, but apparently I’m a moron. Der sigh. Categories Fruit of my womb, Le sigh, More cowbell! So the other day BigHugs, who hasn’t been feeling very well this week, comes up to me and says, “I have a hot.” Goose said, “I think she means she has a cold.” I think she was feeling hot and was just trying to avoid saying the other word, considering what happened the last time she tried to have a serious conversation about her health issues with her mother. Last week, DynaGirl got Singstar for her birthday. It’s a karaoke game for Playstation. They have several versions, including 80’s, 90’s, rock, pop and amped. I picked up amped. How could I not? It has “Don’t Fear the Reaper” on it. DynaGirl and Mr. T tried it out in duet mode, and did a pretty good job. But, of course, the whole time I kept thinking, “I need more cowbell.” I decided right then and there, this family must acquire a cowbell. I first checked with my local music store, but all of their cowbells are designed to be mounted with a drum set. So I checked online. My first stop was Amazon. They seem to have everything, plus I like reading the customer reviews. I find them very helpful. Well, there are plenty of useless reviews like “this sucked” or “I don’t actually have this, but it looks awesome”, but occasionally you find someone who obviously knows what they’re talking about and offers some helpful insights. Like this guy in his review of the Basic Beat Black Cowbell. We’ll call him J from Texas. 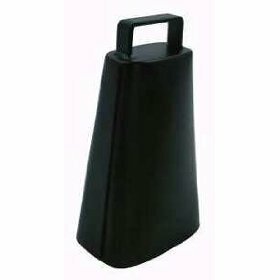 Looking back on my long musical career, I have played many instruments, but I keep coming back to my first love… the cowbell. Oh sure, I’ve tried them all – from triangle to wood block but I have never felt so in tune with any other instrument than the Cowbell. I have many different cowbells in my collection. Most of these are for a particular mood only. If I am feeling somewhat polka, I always reach for my signature “Shmenge Brothers #6” with the zebrawood handle… for rock it is my “Gussmann Blue-Steel Screamer”… jazz see’s me grab my “Trini Lopez Limmited Addition Melody Master” knock-off. But here is the finest single cowbell I have ever played. It has such a full & pleasant sound it seems to go with any type of music I play. My group was shocked when I showed up to our last gig and I only brought this little beauty with me. They protested at first and even threatened not to do the show, but their fears quickly disovled when I brought the house down with our first song of the night. I can only close with this… Buy this Cowbell and see if I am not right! This thing is a Godsend for any serious cowbeller out there. You will reach new areas of playing that you did not even think were possible. And as if J’s glowing review wasn’t enough to sell me on it, here’s W from Seoul, Korea. 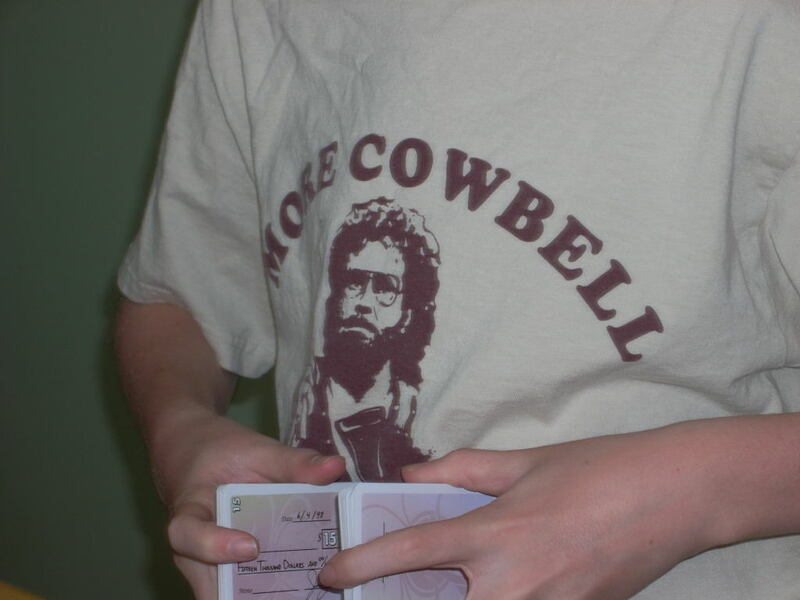 Fellas, I’m tellin’ ya…you’re gonna want more cowbell. 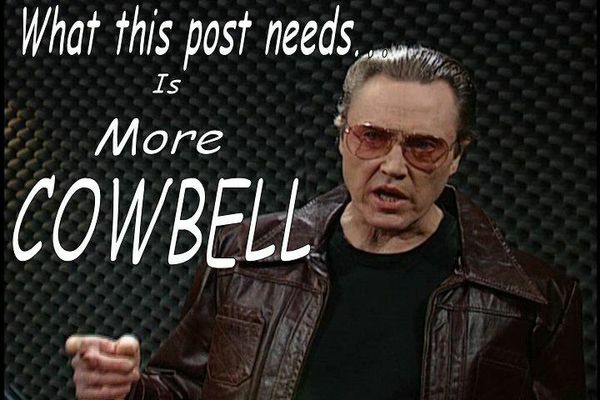 I got a fever and the only prescription is more Basic Beat Black Cowbell! I think I’ve found my cowbell, people. Categories Fruit of my womb, Kid speak, More cowbell! Last night I dreamed that I was volunteering in my daughter’s kindergarten class and Lionel Richie was there doing a mentoring session American Idol style. There was a cute little boy totally rockin’ the Dancing on the Ceiling. Needless to say I was pretty bummed when I woke up before it was Goose’s turn. I wonder what she would have sung? Speaking of Goose, last night I put her in the bath and then went downstairs to swap out some loads of laundry. When I came back up she was lying face down on the bottom of the tub. I called her name and she didn’t move. I called it louder and she didn’t move. Just as I was about to scoop her up out of the bathtub she sat up. Scared the holy living crap out of me. I totally gave her the what for about not scaring me like that ever again. Note to all—it’s never funny to pretend that you’re dead. Never. Ever. Ever. It ruined my whole night. I’m getting a little sick just telling you all about it now. Speaking of sick, BigHugs has a bad cold and nasty cough. Yesterday she woke up all tired and coughy and said, “Mom, I’m sick. I have a fevah.” And can you guess what I said? What I had to say? “Is the only prescription more cowbell?” Sometimes my humor is totally lost on my 2 year old. Speaking of humor, I enjoyed all y’all’s search term hits on last week’s Wacky Search Term Wednesday post. Jumbo Shrimp will be receiving her very own genuine miniature sock monkey. Could you e-mail me your address, Jumbo? I thought I had it, but I seem to have misplaced it. As soon as I get it, I’ll send off your monkey and maybe a few other very “special” bythelbs’s signature surprises post haste. Speaking of post, this is my 99th! Which means tomorrow, barring any unforseen emergencies or natural disasters, will be my 100th post. Any ideas on what I should do? FYI, I’m not particularly interested in making a list of 100 random things about me. First of all, I’m not sure that I could come up with 100 things. And also that would be boring. And if there’s anything a 100th post shouldn’t be, it’s boring. So help me out with your brilliant ideas (you’ve only got today, though, so get on it!) and save us all from the boring. Speaking of boring, I was bored to pieces yesterday. Reese’s Pieces. Literally. And by that I mean I was so bored that I kept going to the pantry for something to snack on and found my secret stash of Reese’s treats (Chuck you didn’t hear or er, read that) and inhaled a bag of Reese’s Pieces. Well, not the whole bag. About halfway through I lost interest. I started feeling sick actually. I’m sure it had nothing to do with the cheezits and salsa verde doritos and mint oreos and spoonfuls of peanut butter I had already eaten. Why do I do these things to myself? Why? Why?! Speaking of why? why?! My girls normally ride the bus to school, but this week it’s been all rainy and cold and I haven’t wanted to drag BigHugs out in the rain and cold with her cough and cold, so I’ve just been driving to school. Can I tell you how much I hate driving to school? I’m not sure that I can. Are there adequate words to describe my frustration and pissed-off-ed-ness with all those parents who are incapable of grasping the idea of pull forward? Pull forward, people! It’s not that hard! See all those cars behind you just waiting, waiting, waiting when there is like 6 car lengths of free space ahead of you?! What’s the matter with you?! Speaking of what’s the matter with you, what’s the matter with me? The other day I had a lovely couple come to my door spreading the good word about the good book, and all I could think of was how totally hot that guy was. No seriously, I had no idea there were JW’s that were that attractive. (Sorry, Chuck, but he was. Not as attractive as you, of course, but still.) Not that I’ve ever thought that unattractiveness was a shared quality among the lovely people that are Jehovah’s Witnesses, but seriously, this guy was really cute. And I was trying really hard not to look like I was checking him out because his wife was standing right there. Needless to say, I accepted his literature with a smile. Speaking of smile, what’s making you smile today? Friday Funnies and You know what this post needs? Here’s another one Chuck picked out for me. Chuck is nothing, if not subtle. I’ve seen this a googillion times and it just never gets old for me. It’s like I’ve gotta fevuh and the only prescription is more cowbell. 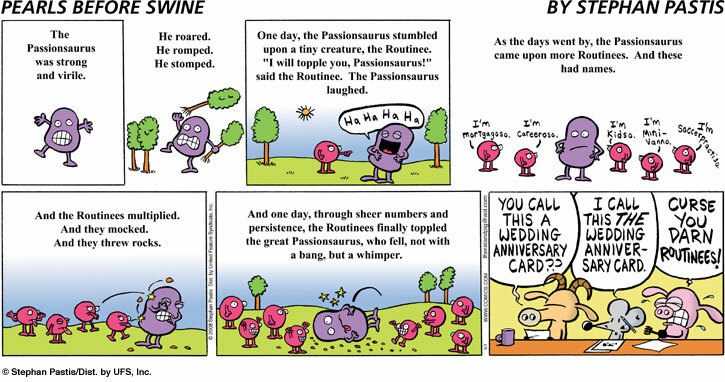 Categories Friday Funnies, More cowbell!